When you have gone through a difficult time, or are in the midst of it, there are days when all you want to do is sink into despair. It is so easy to wallow in self pity and rage about the injustices done to you. There are days when it feels like nothing good will happen to you and you will never get through this time in your life. I remember certain points in time when I was acutely aware that I was at risk to sink into depression. I remember being tempted to just let go and allow the tsunami waves of despair engulf me and carry me away to the land of hardened apathy. But, I couldn’t do it. I knew that I had to fight. I knew that my kids needed to see me rise above. I knew it would be an invaluable life lesson for them to see me grab a surf board and ride those waves to the land of determined self worth instead. So, day after day, I found some strength to climb up on that surf board and stand, shaking and trembling to find my balance. I fell off more times than I stayed on. Some days I cried and raged with the frustration of how hard it was. Some days I would play with the idea of letting the surf board go and sinking into the waves instead. Something interesting happened, though. My muscles got stronger each day that I got back on. After awhile, my legs stopped shaking and my core strength kept me standing strong. One day, it was no longer so scary and I started to enjoy the ride! It became exhilarating. …the wind in my hair, my board rising high on the waves! I started to have the confidence that I could do this. I was going to make it! Why would I want to sink into the waves when I could have that feeling instead? It did take courage for me to make those choices day after day. It took courage I didn’t know I had. And, it was worth it. Because I can honestly and truly say I am happier than I have ever been in my life. Hmmmm…. can I live in Tuscany too? 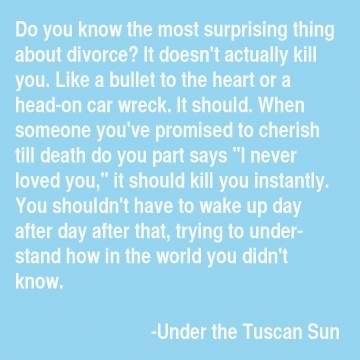 Under the Tuscan Sun is another of my favorite movies, and another one that affected me deeply before I ever imagined that I might one day be divorced. I was so moved by the courage of the main character. I have watched it a few times in recent years and it is now even more meaningful to me. It is a funny, touching, and inspiring example of how someone can bounce back from an experience like an unexpected divorce, and find joy in creating a new life. One of the things I love about this movie, is that there is an honest expression of the initial shock and pain that comes in the wake of the revelation that your marriage is over. The initial beating oneself up, questioning, agonizing over the hows and whys is portrayed very well by Diane Lane’s character. Then, there is the pushing and nudging from friends to move on with life, and the first steps to get brave and do so. Although this character takes a much bolder step than most of us would, it highlights the terrifying and empowering feeling of stepping out to create a new life. Sometimes you have to let the ladybugs come to you by living your life with purpose and joy. Sometimes you need to build the train tracks before there are any trains to travel on them so the way has been made ready. Because when the train is ready to come, and it will be… the tracks will be solid and strong and it just might be the ride of your life! “Many of my research participants who had gone through a painful breakup or divorce, been betrayed by a partner, or experienced a distant or uncaring relationship with a parent or family member spoke about responding to their pain with a story about being unlovable—a narrative questioning if they were worthy of being loved. This may be the most dangerous conspiracy theory of all. If there’s one thing I’ve learned over the past thirteen years, it’s this: Just because someone isn’t willing or able to love us, it doesn’t mean that we are unlovable.” Brene Brown on her new book, Rising Strong. In the early days after the separation, this was a very real struggle for me. I would lie awake at night, going over and over in my mind where I went wrong. I would try to figure out what was so inherently wrong with me that provoked the rejection I was experiencing. It hurt so much, and I wanted to figure it out so I could ease the pain. On some level, I thought if I could fix my flaws, it could all be okay. It took some time for me to realize it wasn’t about me. My counselor helped me with this. My former husband either wasn’t willing or wasn’t able to love me. I have some thoughts about the “why” of that, but really, it doesn’t matter anymore. Coming to terms with that reality was very freeing to me. I no longer needed to spend tremendous amounts of energy trying so hard to be who he seemed to want me to be, and change in ways that would hopefully cause him to notice me. No wonder all of those efforts had no effect. He was either unwilling or unable to love me. I started to allow myself to see who I really was. I took off the lens I had been looking at myself through for over twenty years…. the lens of his opinion of me. I looked at myself through my own lens. I began to write in a journal about my good qualities, my strengths, my interests. I remembered and wrote about what gives me joy and makes me feel alive. I did not allow words of judgement towards myself. I chose to think about myself in positive terms. A friend of mine suggested to me to start each day by making eye contact with myself in the mirror and saying to myself, “You are worth it.” At first, it was excruciatingly uncomfortable to do this. But, I persisted. Eventually, it felt more comfortable. After a while, I noticed a little smile on my lips when I said it. One day, I said it with conviction. I realized I truly meant it. I felt such joy! This was a turning point for me. Believe it, and live your life from this truth. It changes things when you do. I’m not sure at what point I became aware of not being wanted in my marriage. I know it wasn’t that way in the beginning. But, over time I would realize that I wasn’t being noticed anymore. I wasn’t being seen. I recall feeling invisible and insignificant. I also remember trying to talk to him about it, and those conversations did not go well. My memory of those conversations were that I was told I was misreading things and putting too much pressure on him. So, instead I found myself trying harder to get his attention. I would lose weight, change my hair color, learn something new, take more interests in his interests. But, none of that worked. Eventually, I was rejected all together. As painful as that was, I now see the gift in it. For some reason, when the subtle ongoing rejections went on for years, I somehow tolerated that and allowed it to chip away at my self esteem. But a clear and direct rejection triggered something different in me. Something inside rose up to counter that rejection. Some part of me knew I did not deserve this. For years I questioned that. The knowledge that I am worth wanting gave me the strength and courage to take action and move forward. That was the beginning of learning to love and accept myself just as I am. One of the hardest lessons for me to learn in my healing process was to let go of the past. Early in the separation, I had naively believed that it would be helpful for my former husband and I to discuss the marriage breakdown and even the marriage prior to that. It took me far too long to realize that I was causing myself ongoing pain and re-opening wounds by doing that. He did not remember many of the events and words that had cut me open and shattered my heart. Moments and words are seared into my memory forever because they were so shocking and devastating to me. But, he did not remember. So, my pain was minimized or questioned. For awhile I tried to sort out all the reasons for this or whether he really did remember but was hiding from taking responsibility. After awhile longer, I realized it doesn’t matter. Giving it so much mental energy was hurting me too. I made a decision to let go. What is in the past is in the past. I can’t change it. 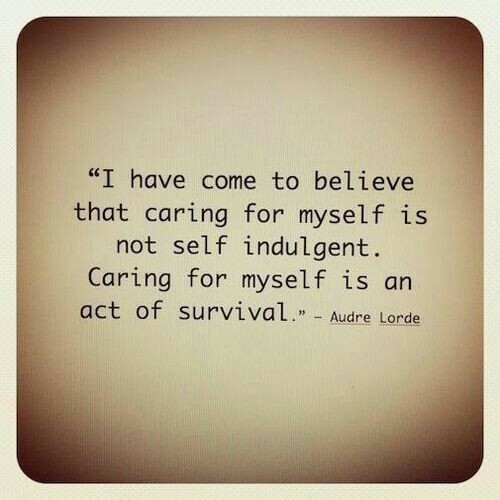 Instead, I took responsibility for my own healing process. When memories come back, I take a deep breath and remind myself to let it go. Forgiveness is a process over time, and I committed to that process years ago. 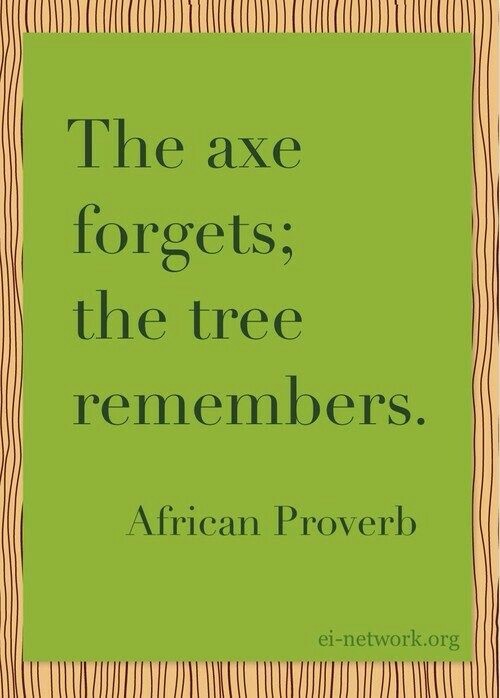 The tree will always remember, but that doesn’t mean the tree can’t have new growth. My new little sapling of a life has deep roots and I know it will grow tall and strong. This truth was a huge perspective shift for me. As I was raising my kids, trying to be the best wife and mom I could be while working full time, my needs came last. I thought I was doing the right thing. I thought this was loving behavior. I now see it differently. By consistently ignoring my needs, I came to believe, over time, that my needs truly were less important than my husband’s or my children’s needs. I came to value myself less. And, by doing so, I taught them to value me less as well. I also depleted myself and was worn out a good part of the time. I stopped doing things for myself that re-energized me or filled me back up so I could have more to give. How is it loving behavior to function this way? What good purpose did it serve? I lost touch with who I am. I know that sounds cliche, but it’s true. I forgot what made me feel alive and joyful. For me, life was a daily choice to remind myself to see the good and muster up the energy needed to meet everyone’s needs for that day. Post divorce, I made self care a priority. I take time to read and I joined a book club with fabulous women who inspire me. I set aside a little in my budget for pampering. I use my benefit plan from work to get regular massages. I stay in touch with my friends so my social needs are met and I can give and receive support regularly. I make my faith a priority and make time daily for prayer and gratitude. I am working on being more physically active and have remembered why I love yoga so much. I listen to music all the time. I see my counselor when I need to. My kids have commented many times how much happier I am now. They love seeing me happy. It doesn’t take anything away from them because they know they are still my priority and always will be. But, I am now teaching them that my needs are of equal value to theirs and modeling for them how to take good care of themselves. The most loving thing I can do for those I love is to love myself too. I finally get it. It’s funny that my last post, The Soundtrack of my life, doesn’t accurately reflect my musical tastes… or not fully. They tell a story. But, in my every day life, in which I listen to music frequently throughout each day, I most often listen to rock music. This morning, I was listening to an acoustic version of a favorite of mine, “Times Like These” by the Foo Fighters. I am a fan of Dave Grohl, and love this version.